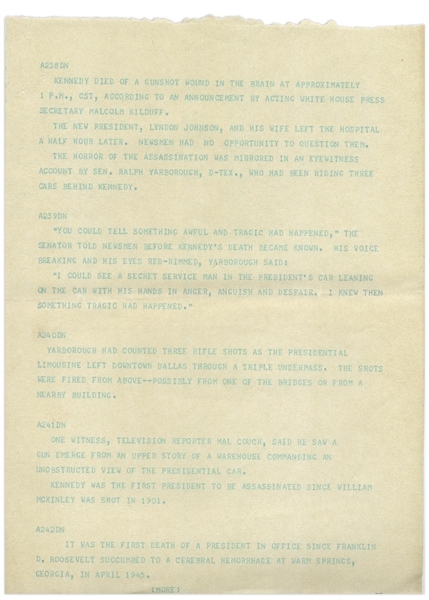 Original Associated Press teletype from 22 November 1963, providing visceral details and eyewitness accounts of the scene in Dallas just after John F. Kennedy's assassination. Teletype begins, ''Kennedy died of a gunshot wound in the brain at approximately 1P.M., CST...The new President, Lyndon Johnson, and his wife left the hospital a half hour later. Newsmen had no opportunity to question them. The horror of the assassination was mirrored in an eyewitness account by Sen. Ralph Yarborough, D-Tex., who had been riding three cars behind Kennedy. / 'You could tell something awful and tragic had happened,' the Senator told newsmen...His voice breaking and his eyes red-rimmed, Yarborough said: 'I could see a Secret Service man in the President's car leaning on the car with his hands in anger, anguish and despair. I knew then something tragic had happened.' / Yarborough had counted three rifle shots...One witness, television reporter Mal Couch, said he saw a gun emerge from an upper story of a warehouse commanding an unobstructed view of the Presidential car...'' Teletype measures 8.5'' x 11.5''. Staple puncture to upper left, overall very good condition.